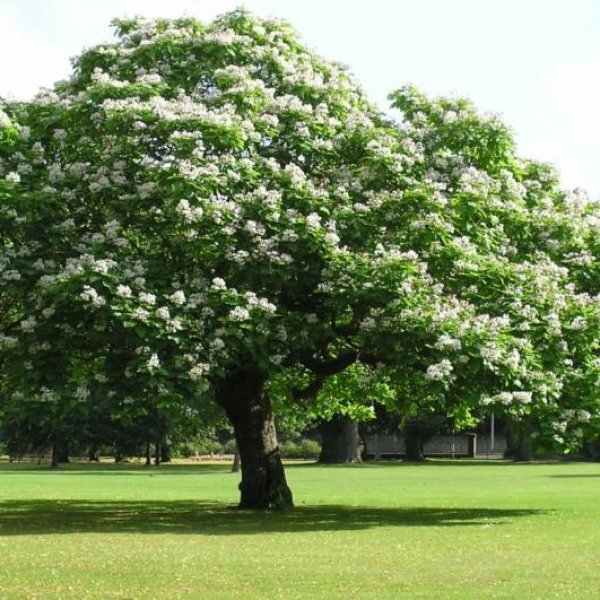 Northern catalpa is a deciduous very fast growing tree with an irregular to oval form. It is native to a small area in an interior south-central region of the United States. 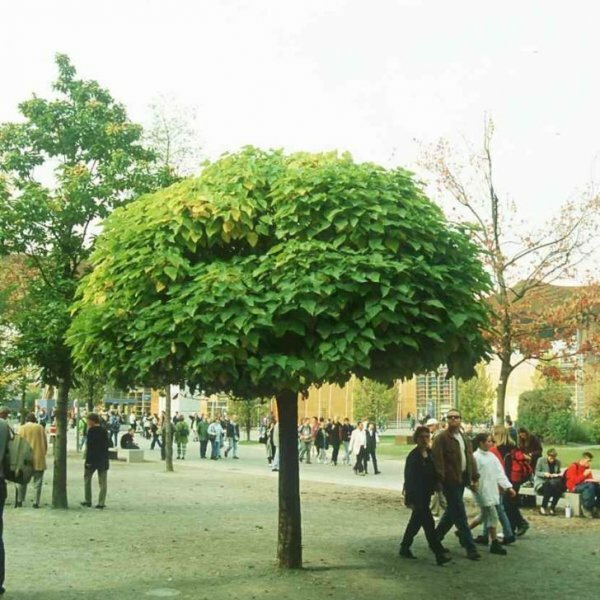 Leaves are medium to dark green and heart-shaped. 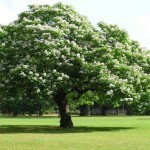 This catalpa bears fragrant white flowers with yellow and purple markings in spring. These produce long, bean-like fruit pods. Germination Seeds can be soaked and sown with no pretreatment, but it could increase the germination rate. 1. Soak seeds in warm water for 12 hours. 2. Pour the seeds into a plastic storage bag with moist and sterile sand or vermiculite and place the bag into a refrigerator that maintains a temperature of 34 degrees Fahrenheit. Keep the seeds in this location for three weeks. 3. Fill a seed tray with potting soil until it reaches 1/2 inch from the top of the tray. 4. Remove the seeds from the refrigerator. Poke holes in the soil that are 1/4 inch deep and insert one Catalpa seed into each hole. Cover the holes with soil. 5. 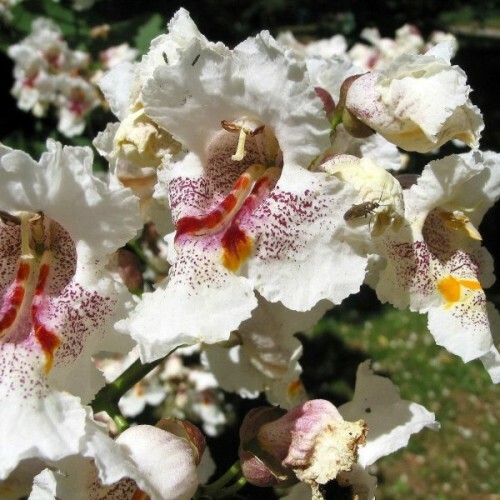 Water the soil daily and keep it constantly moist until the Catalpa seeds germinate. Afterward, water the plants when the top of the soil feels dry. 6. Wait until the plants reach approximately 3 to 4 inches tall and dig them out of the seed tray gently using your fingers. 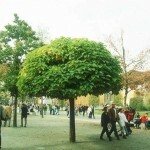 Insert one Catalpa tree seedling into a 5- to 6-inch diameter plant pot filled with potting soil. 7. 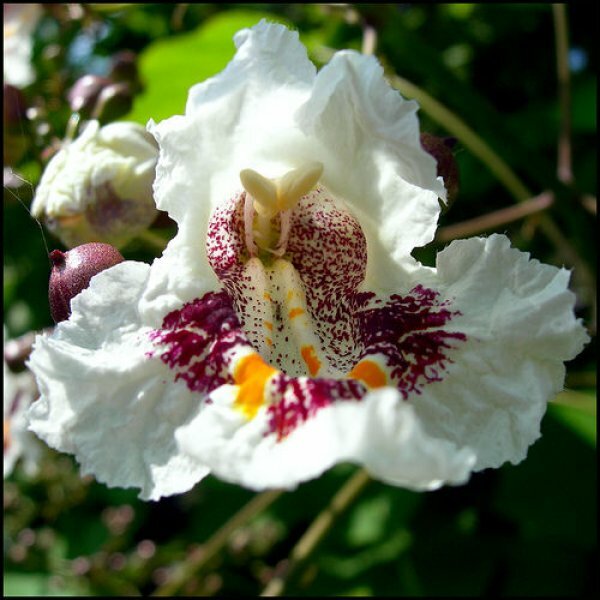 Water the Catalpa seeds as needed throughout the winter months and keep them in an indoor location or greenhouse until the threat of frost has passed in the spring. 8. Select an outdoor planting location that is in full sun. Catalpa seeds will grow in all types of soil but prefer slightly moist locations.